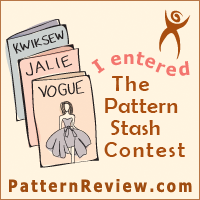 So my first and only entry for the Pattern Stash Contest over at Pattern Runway is a Tunic that has been modified into a dress jacket/coat thing. I made this for my mum who wanted something lightweight to go over a lovely dark blue dress that she has. 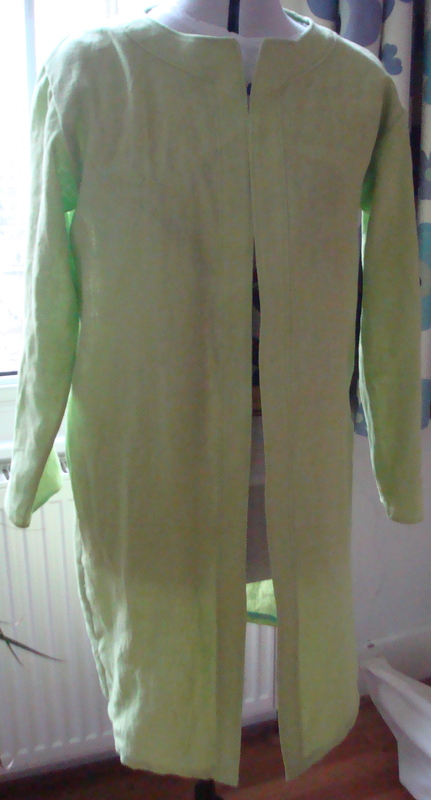 It’s a linen in a bright lime green colour. To be honest, when my mum described what she wanted, my initial reaction was not the positive supportive good daughter response that she should have had. Instead, she was greeted with silence and a distinct lack of enthusiasm. To which point my mum responded with: ‘You’re just like your great Aunt, she never wanted to make things for other people unless she liked it’. Too true…. It’s very hard making things for other people without some parts of your own personal taste their choices, don’t you think? 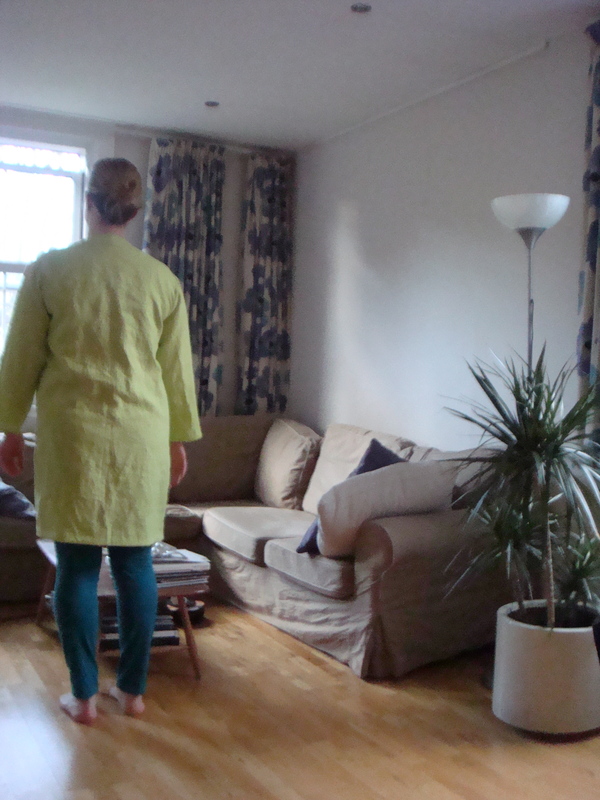 Pattern: Burdastyle 05/2012 – Tunic 116 A. Anyway this is the story of the Tunic Jacket/Coat hybrid thing – I haven’t decided yet what it is! The only thing I care about is that my mum likes it and it made her happy :-). 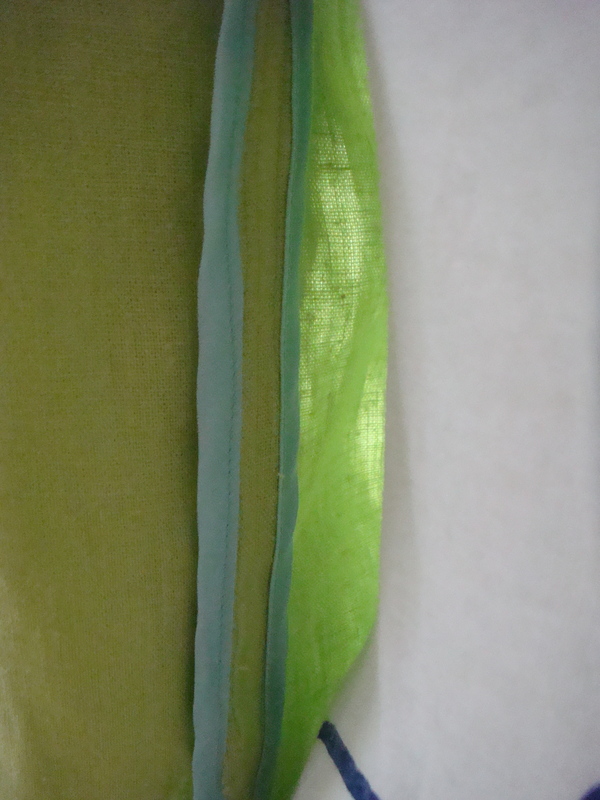 It’s unlined, made from linen in a bright lime green colour. I took several pictures but couldn’t manage to capture the exact shade, but it is basically the same as Pantone Tender Shoots. 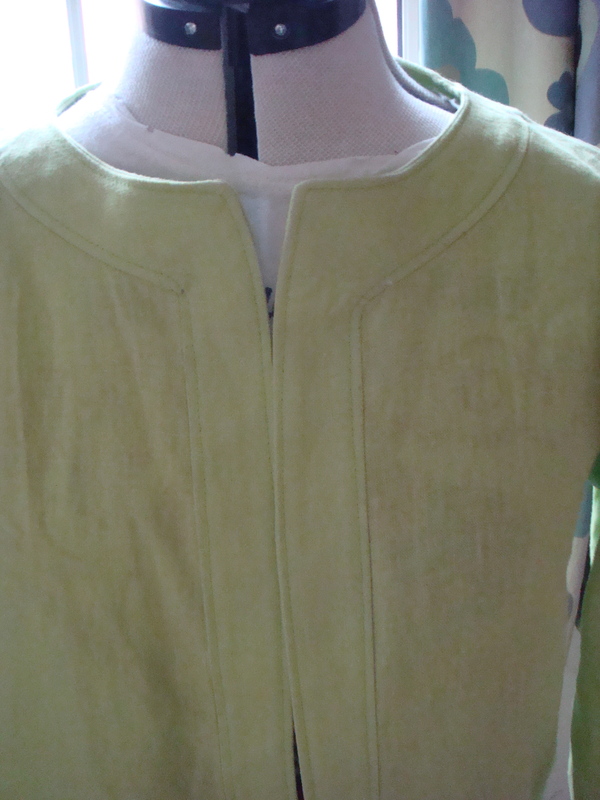 I started out thinking I would do a simple seam finish, the one where you stitch in a straight line and press under. However I wasn’t anticipating how super badly this fabric frays! And I’d already sewn it together, so it was too late to undo and French seam it. In the end I decided to put binding on the seams to cover the frayed edges.